HAPPY NEW YEAR EVERYBODY. HERE IS WISHING ALL YOUR DREAMS COME TRUE . 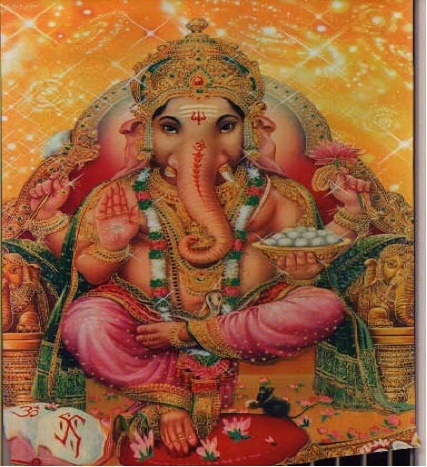 Amongst Hindu and Vedic prayers, one of the most important is the Lord Ganesh Mantra. This is because Lord Ganesh(a) is considered the remover of obstacles, and prayers to this aspect of the One God, is a request for His help in making all good projects one undertakes successful. Given that many of us are going to undertake new projects and make new resolutions as we prepare to ring in the new year, I felt this would be a great time to make available to you this timeless mantra of Lord Ganesha, to ensure that you are successful with all your projects and plans. There are many Lord Ganesha mantras and prayers, but the most complete and powerful is the Vakratunda Mahakaya Mantra, and this is the one I have provided free MP3s for download below. Also, I have selected a good YouTube video of the Vakratunda mantra for your enjoyment. The primary objective of this mantra is to bestow success and to have all obstacles removed from your path. Thus, this mantra is the starting point of all new projects, rituals, ceremonies and prayers. Any new work, project or event, is generally begun with an acknowledgment of Lord Ganesha, to ask for success, and often the mantra below is used for that prayer. Lord Ganesha’s Vakratunda Mahakaya Mantra will of course become part of the Free Online Mantra MP3 Downloads collection we have been putting together here on Mastery of Meditation and Yoga. In this collection, you will find other great mantras as well, such as most sacred Gayatri Mantra and the powerful Mahamritunjya Mantra of Lord Shiva, amongst others. “O Lord, with large body, curved trunk and the radiance of a million suns. Please make all my good work free of obstacles, always”. The veteran Vedic scholar may notice that there is also a slightly different version of this mantra, which is also very common and reads “Sarva Karyeshu Sarvada” instead of “Shubha Karyeshu Sarvada”. The essential difference is that the version of the mantra I provided, says, “make all my good work free of obstacles”, while the other version says, “make all my work free of obstacles”. Hopefully all your work is good work, so either version is fine . Bestows success for the project one undertakes. Removes difficulties and obstacles from one’s path. Used to remove evil and negative influences. Acknowledges Lord Ganesha, who represents Prosperity, Progress, Auspiciousness, Profit, Wisdom and Salvation. Here is Lord Ganesha’s Vakratunda Mahakaya mantra MP3s for you all to download and enjoy. Again, use this mantra prior to starting any project to ask Infinity to help remove all obstacles from your path and give you success. Right click link below and chose “Save Link As…” or “Save Target As…” to save to your computer. Please download to your computer, if you plan to play it often. Here is also a nice video of Lord Ganesha’s Vakratunda Mahakaya Mantra from YouTube…. Thanks for sharing a Wonderful Article. Ganesh Mantra not only gives the reward of one’s efforts but accelerates one’s progress and help to become a better person in life. for ganesh loard we should pray by speaking his eight name then ignore ur problem and go to write way i do same thing.